C# is the mostly used programming language with developers all over the world creating wide range of softwares. C# is used to create web applications, Windows applications, mobile applications for windows phones, WebAPIs and many more. Now with the help of Xamarine studio you can develop native apps for Android and iOS. This indicates how much C# is popular in developer’s community. Starting and learning development is very easy in C#. C# is a modern, object oriented language which holds lots of features. Microsoft provides an IDE called Visual Studio which makes your learning easy. It is available free of cost for students and small teams. You can download and install it and start coding. C# 5.0 released in 2012 and C# 6.0 released in July, 2015. Here we have short listed some of the best books on C# which will help you learning this powerful language. These books are useful for learning the language for beginners as well as they can also be used for reference by new and experienced programmers. By Andrew Stellman and Jennifer Greene. This book is dedicated for beginners. All head first series books are targeted for beginners. Head First C# is the perfect first book for any Beginner who is trying to learn this language. This book teaches the advance concepts in very easy manner. If you have never read any Head first series book then you should instantly buy this book (and if you know about head first series then this was the first book you ordered). It covers c#.net winforms, xaml, windows 8 apps, and window phone apps. In the first chapter you will build a windows 8 game using C# (They have provided a free pdf to cover WPF for who doesn’t have windows 8 operating system, those folks can make this video game using WPF). You will learn how to use Model-View-View Model (MVVM) pattern to create robust architecture, how to use XAML to design attractive and interactive pages and windows and how to build Windows Phone project and run it in the Visual Studio Windows Phone emulator. By the end of this book you will master the object-oriented programming in C# and how to turn the real world objects into programs. By E Balagurusamy. This book is also targeted for beginners. This book is little bit old, published in 2010, but every stuff it talks about will work perfectly. You will not get updated about the latest features of C# language but you will learn the core C# features, which is the basic of the language. This book is very good for building your C# basics strong. Written for novice programmers who want to learn programming with C# and the .NET framework, this book offers programming basics such as variables, flow control, and object oriented programming. It then moves into web and Windows programming and data access (databases and XML). As a book for beginner it also delves into WPF and other key technologies for creating and deploying desktop applications, covers Windows Store apps, looks at ASP.NET web programming and deploying web applications. The authors are some of the best in the business, but many readers has complained that the publisher (worx) has made the text size of the book very small which causes many readers difficult to read it. A new version of this book is going to release this year in December “Beginning Visual C# 2015 Programming” which includes the latest C# 6.0 features. You can also check “Beginning Object-Oriented Programming with C#” book which covers the object oriented programming concept. By RB Whitaker. The C# Player’s Guide is the ultimate guide for people starting out with C#, whether you are new to programming, or an experienced vet. This guide takes you from your journey’s beginning, through the most challenging parts of programming in C#, and does so in a way that is casual, informative, and fun. Above you read about the books that are for beginners. This section lists some books which are best for those folks who are already familiar with core C# concepts, folks who are intermediate or Advance C# developers. IF you have some C# knowledge, like you get core C# knowledge from internet or other books then you should consider to use these books. By Joseph Albahari and Ben Albahari. This a reference book not a tutorial book. It covers a huge array of topics. This bestselling guide is recommended by many C# developers and if you are full time developer you should have this book in your shelf. This book tells you exactly what each class does, what happens behind the scenes and densely packed with useful information. We recommend this book to one who is looking for immediate to advance knowledge on C#. However if you are just starting on C#, you better get C# core knowledge using other book(s) before picking this one because this book does require some basic C# knowledge. A new version of this book “C# 6.0 in a nutshell: The Definitive Guide” is going to release in November this year. 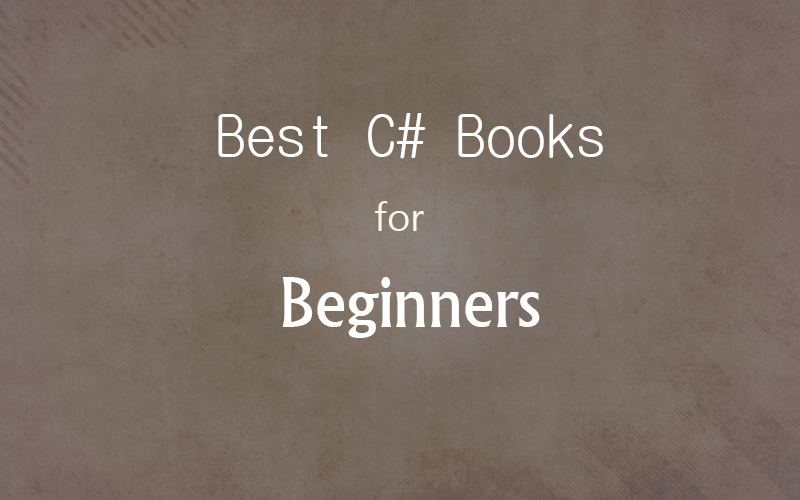 Above we listed some of the best books which would defiantly be very helpful for any C# beginner. We have also listed some books for guys who are not complete C# beginner. As in July this year C# 6.0 released, so there are many C# books upcoming who will cover these new features. We will update this list as soon as new books arrive in the market. If you have any suggestion then let us know via comments. Now 3rd edition of the book is available. Hope newer version will help you more.